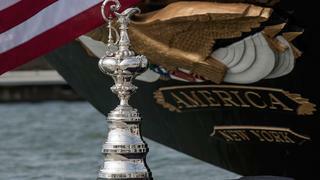 1 - What is the America's Cup? What is the America's Cup? The America’s Cup is the oldest international sporting trophy in the world, first contested in 1851 in a race around the Isle of Wight. It could also make a claim to be the most unfair competition in all sport, because the winner (the ‘Defender’) gets to choose the venue for the next edition, and in large part sets the rules of engagement. Part of the mystery and allure of the America's Cup is that it is not contested on a level playing field, literally or metaphorically. The deck is skewed heavily in favour of the Defender, who is guaranteed a place in the final match. The America’s Cup is the oldest international sporting trophy in the world, first contested in 1851 in a race around the Isle of Wight. It could also make a claim to be the most unfair competition in all sport, because the winner (the ‘Defender’) gets to choose the venue for the next edition, and in large part sets the rules of engagement. Part of the mystery and allure of the America's Cup is that it is not contested on a level playing field, literally or metaphorically. The deck is skewed heavily in favour of the Defender, who is guaranteed a place in the final match. 2 - How does the America's Cup competition work? How does the America's Cup competition work? The America’s Cup is a match race, one against one, sailing’s equivalent of a boxing match. First the challenger teams must battle each other to find out which team has earned the right to take on the Defender in the America’s Cup itself (who will always have a space). They do this in a series of racing events called the America's Cup World Series. These ACWS are discrete events with a winner, although points are accumulated across all the events. It's important to note that, although the competition is weighted in favour of the Defender, Oracle Team USA still thinks the America's Cup World Series is important. The ACWS events have four races: two on Saturday and two on Sunday. The Sunday races count for double the points. All points are carried forward over all of the Louis Vuitton America’s Cup World Series events. At the end of the ACWS, the top team gets 2 bonus points for the Cup Qualifiers in 2017, while the second place team gets one bonus point. The Louis Vuitton America’s Cup Qualifiers are for all teams - including the current Defender, Oracle Team USA. The regatta comprises a double ‘round robin’ - meaning that every team gets to race against every other team once per round. The top four challengers advance to the Louis Vuitton America’s Cup Playoffs, progressing through a Semi-Final to a two-boat Final. This final America's Cup race decides the winner. 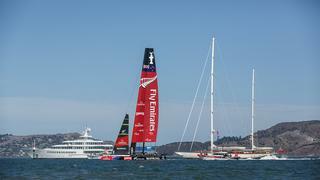 The America’s Cup is a match race, one against one, sailing’s equivalent of a boxing match. First the challenger teams must battle each other to find out which team has earned the right to take on the Defender in the America’s Cup itself (who will always have a space). They do this in a series of racing events called the America's Cup World Series. These ACWS are discrete events with a winner, although points are accumulated across all the events. It's important to note that, although the competition is weighted in favour of the Defender, Oracle Team USA still thinks the America's Cup World Series is important. The ACWS events have four races: two on Saturday and two on Sunday. The Sunday races count for double the points. All points are carried forward over all of the Louis Vuitton America’s Cup World Series events. At the end of the ACWS, the top team gets 2 bonus points for the Cup Qualifiers in 2017, while the second place team gets one bonus point. The Louis Vuitton America’s Cup Qualifiers are for all teams - including the current Defender, Oracle Team USA. The regatta comprises a double ‘round robin’ - meaning that every team gets to race against every other team once per round. The top four challengers advance to the Louis Vuitton America’s Cup Playoffs, progressing through a Semi-Final to a two-boat Final. This final America's Cup race decides the winner. 3 - How is the 35th America's Cup different? How is the 35th America's Cup different? It used to be that the America’s Cup only took place every few years, and with no racing in between. This was boring for the sailors, and meant the event fell off the radar for spectators and enthusiasts. As of the last 10 years, there have been ‘warm-up’ events to help get sailors and teams up to speed, and to get spectators, sponsors and other people pumped up for the main event. The America’s Cup World Series events were popular during the build-up to the last Cup in San Francisco 2013, but now the events mean more - because they count for points towards the final - whilst also being shorter than ever with just four races per weekend. All the changes to the event are with exciting TV coverage in mind, so while the sailors might prefer more races to even out the luck, TV audiences demand jeopardy and uncertainty. The other big difference is that, at approximately 15 metres long, the catamarans being designed for this edition are the smallest boats ever to be used in the America's Cup’s 160-year history. But that said, they are also expected to be the fastest ever, capable of travelling in excess of 40 knots. Also worth noting is that usually the Defender hosts the event on home waters, yet Oracle Team USA is hosting this Cup in Bermuda, a British Overseas Territory, a choice that isn’t entirely popular with American fans of the Cup. It used to be that the America’s Cup only took place every few years, and with no racing in between. This was boring for the sailors, and meant the event fell off the radar for spectators and enthusiasts. As of the last 10 years, there have been ‘warm-up’ events to help get sailors and teams up to speed, and to get spectators, sponsors and other people pumped up for the main event. The America’s Cup World Series events were popular during the build-up to the last Cup in San Francisco 2013, but now the events mean more - because they count for points towards the final - whilst also being shorter than ever with just four races per weekend. All the changes to the event are with exciting TV coverage in mind, so while the sailors might prefer more races to even out the luck, TV audiences demand jeopardy and uncertainty. 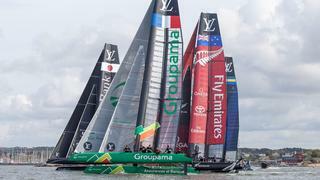 The other big difference is that, at approximately 15 metres long, the catamarans being designed for this edition are the smallest boats ever to be used in the America's Cup’s 160-year history. But that said, they are also expected to be the fastest ever, capable of travelling in excess of 40 knots. Also worth noting is that usually the Defender hosts the event on home waters, yet Oracle Team USA is hosting this Cup in Bermuda, a British Overseas Territory, a choice that isn’t entirely popular with American fans of the Cup.